BLAZIN' BLUE is a new generation of surfactants and builders that effectively emulsify and suspend even the most difficult soils. HIGH CLEANING POWER - Blazin' Blue will surpass all other extraction agents due to its excellent soil suspension and removal capabilities. The result will be reduced cleaning times and very satisfied customers. 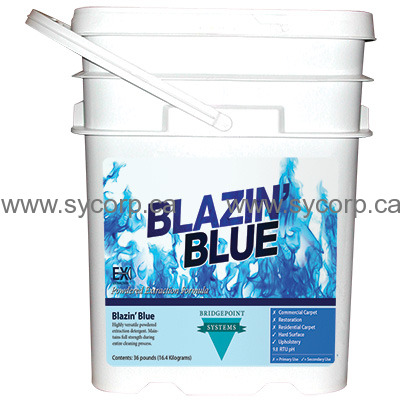 HIGH CONCENTRATE, LOW COST - When compared to other powders or liquids, Blazin' Blue will save money. Because of Blazin' Blue's concentration, more carpets will be cleaned at a lower cost. Each pound of product will make up to 420 gallons of ready to use cleaning solution. EASY MIXING - Cold water is all it takes to dissolve Blazin' Blue. LOW RESOIL - With the advanced surfactant formulation in Blazin' Blue, residue will not attract soil, and in fact may help the carpet stay cleaner longer. SAFE - Blazin' Blue has special additives that help prevent corrosion and buildup in the extractor or truck mount, and at the same time, its buffered pH (9.8) is safe for use on 5th generation carpet.